A love of animals on its own is not enough to help a hedgehog in trouble. So you've got yourself a hedgehog that seems to need help. You've read our emergency page and our Rescue or Leave page and decided the animal needs help. First off don't panic. Hopefully you now have the hedgehog somewhere safe, warm and quiet. Somewhere it can't escape from. If not, please go and get it. We normally advise you to get the animal to a vet or rescue immediately and if it is injured, screaming or coughing and sneezing then you should do so immediately but there are occasions when you can look after these amazing little creatures yourself. Firstly I need to stress this - hedgehogs are NOT a project for your children. These animals look hardy but can easily die from stress. Handling must be kept to a minimum, they cannot be taken to school and they are not entertainment for friends. We need them to be as wild as possible when they are released so that they don't end up being used as a football. Are you sure it's a hedgehog? This is not as daft as it sounds. Many people have no idea what a hedgehog looks like and a variety of things have been rescued in the past that really were not hogs. The point of this bit is, have you got a wild hedgehog or a pet pygmy hog that's been dumped? Care for each is completely different but one thing is certain, Pygmy hogs cannot live in the wild and must be rescued. 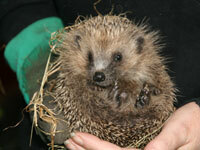 If your hedgehog is injured, covered in maggots or crying it MUST be taken to a qualified rescue or vet immediately. Do not think you can love it or cuddle it better. There is no substitute for correct medical care and failure to seek it can render you liable to prosecution under the Wildlife Act. Sick animals do not have time for you to decide what you are going to do. Act immediately! Fleas - Hedgehogs rarely have them and are usually sick if they do. Under NO CIRCUMSTANCES do you spray them with Frontline or any other preparation for cats and dogs. You will cause breathing difficulties and may kill the hog. If you can see fleas, and hedgehog fleas are easy to spot as they are twice the size of dog and cat fleas, don't worry, they only like hedgehogs, they will not infest your house. Call a rescue who will have an appropriate insecticide but if you need to take the animal to a vet ask them to use something for caged birds. Mites - Mange and ringworm can look similar to the untrained eye and a hog with one can often have the other as well. You will see bald patches, possibly what looks like a coating of white powder round the face, often a thickened white crusting. There may be clumps of spines and/or fur missing and in advanced cases, open sores where the animal has been scratching or biting. WEAR GLOVES! Both of these can be passed to us and you should call a rescue immediately. Treatment for these involves a complicated mix of things including antibiotics. The rescue may be able to help you or they may prefer to take the animal in and let you have it back in 3-4 weeks once it's better. Either way do not try and look after these animals without help. Ticks - In Berkshire almost all hedgehogs come in with ticks. They look like small peas ranging from white to grey and they can be anywhere on the body but particularly behind ears and round the bottom. These should be removed with a tick hook or lasso and then squashed. Take them outside, put them on the floor and do the twist on them, don't release them, they breed like mad and will just find something else to feed off, possibly you. DO NOT coat the ticks with oil or nail varnish. Research has shown that stressing the tick in any way will cause it to regurgitate its stomach contents into the host which can cause blood poisoning. Vets sell tick hooks cheaply and we have some sets for sale at Hedgehog Bottom. If the animal is covered in ticks then please take it to a rescue or vet to get them removed immediately. It's likely the hog will be anaemic and need B12 shots, it will certainly have some other underlying problem and may need wormers and antibiotics that you cannot buy yourself. Flystrike - In warmer weather a sick hog will get attacked by flies and those flies lay eggs on them. Check the hog over carefully and if you find clumps of tiny white grains of rice they must be removed immediately. If left they will hatch into maggots and the hog will be eaten alive. Call a rescue for advice or take the animal to them. Needless to say, if you see maggots then the animal needs urgent help and you must not delay. Whilst a cardboard box is OK when you first get the hog it won't last long. Upturned water bowls, urine and other unmentionables will soon make the cardboard soggy and the hog will bust out and wreak havoc. 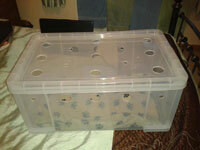 Hedgehogs like wreaking havoc and it's best they don't do it on your carpet so get yourself a large plastic storage box. The pound stores often sell the 80-120 litre boxes reasonably priced and they are ideal - firstly because they are nice and deep and hopefully escape proof, and secondly because they are easy to clean. You could also use a rabbit hutch but make sure it's clean and doesn't have chicken wire on the door which can cut noses and paws. If you choose a box and it has a lid be careful. If you put the lid on you must drill holes in the box and/or the lid approximately a centimetre in size and plenty of them. If you don't, apart from the hog suffocating, condensation will form and bedding plus hog will get soaked. The colder the room the box is in the worse the condensation will get. Do not make the holes too big, the crate in the photo is downright dangerous, your hog will climb and try to get out and if it gets its head stuck in one of those it will hang itself. Line the bottom of the housing with thick layers of newspaper to soak up spills. Don't use sawdust as the hog will snuffle in it and may end up inhaling dust onto its lungs. Bedding you can choose what to use but a few words of advice, if your hog is under 600g it will have to be kept indoors to prevent it hibernating. Unless you are a fan of housework I would strongly advise not using hay or straw, it gets everywhere. Cheap fleece blanket or chopped up fleece tops are ideal, a pile will give the hog something to snuggle into, they wash well and dry fast, and you'll be doing a lot of washing. Whatever you use make sure there are no loose threads, zips, pockets or sleeves the hedgehog can get stuck in. Remove any stitching round the edge of blankets. We do not use towels as hogs can scrabble, pull threads and trap or cut themselves. Keep the hog somewhere quiet, radios, TVs, screaming children and barking dogs all cause stress. When we say call, we mean call. Speak to somebody. If you can't get someone at one rescue try another. Never ever email or leave a message on a web site or Facebook page. If the rescue is busy, as most are, it may well be some hours or even days before they see your message and the hog may not have the luxury of time. This is where it gets a bit complicated. Litters can be kept together initially. Hogs found separately should be kept apart until you know they are well and not likely to pass anything on to the others. Try not to keep hogs together if the weight difference is more than 50g as the larger one can often bully the smaller off the food even if there is more than enough for both of them. All hogs in together need to be watched especially if they have only just met. Most hogs will rub along fine but you will occasionally get two that really hate each other and will fight. Split them up immediately and watch your fingers. Few hogs bite but some, especially when they are upset or stressed, will snap at you. They are surprisingly quick and it hurts. A shallow dish or bowl of water should be available at all times. Hedgehogs indoors will drink a lot and they need to. They also pee a lot so please take note of the advice above about lots of newspaper on the floor of the cage. Keep topping up the water as necessary throughout the day. Give good quality cat or dog meat and/or cat biscuits (kibble/crunchies). Feed in the evening in a large shallow dish and give plenty, there should always be some left over in the morning. The only exception to this is when your hog reaches 750g when you need to watch the amount given or switch to lite biscuits. A hog must always be able to fully curl into an impenetrable ball, flab hanging out is not a good look and it puts them at risk once released. You do not want to have to put your hog on a diet before it can be released. Believe me it's near impossible. DO NOT start digging up things in the garden for the hog to have "its natural diet". Things from the garden can contain all sorts of nasties you are not aware of and the object of all your hard work is to save the hog not kill it. The diet detailed above is perfectly healthy for them and they will know what to eat by instinct once they go back to the wild. Don't give treats, really, do not do it, you'll make a rod for your own back. Fairy cakes, digestive biscuits, fruit and scrambled eggs, whilst often recommended on the web are not good for them and they may decide they want to eat nothing else. Latest research - 2017 - Do not feed mealworms, peanuts or sunflower hearts. All of these are high in phosphorus and low in calcium which leads to metabolic bone disease and answers the question as to why we were getting so many little ones in with fractures and deformities. Likewise, no sultanas. They get stuck on their back teeth and cause tooth decay. Bread contains no nutrients, swells up in the stomach and stops them eating anything else that is good for them. This applies equally to birds in your garden and ducks on the lake. Keep bread for your sandwiches and don't subject our wildlife to it. Finally, NO MILK - EVER! If you've picked up tiny babies get them to a rescue for the proper care and the right formula feed. Unless you have this and are prepared to provide it via syringe every hour from 7am to 2am for three weeks, give them to somebody who can. You can always have them back when they are bigger if you speak to the rescue nicely. Get yourself a notebook and put it by the cage. Then get yourself a good set of digital scales. You need to weigh the hog daily at the same time each day and keep a note of it. It's usually best to do this when you're cleaning out so that you don't have to keep disturbing the animal. A healthy hog should be putting on around 10g a day, sometimes more, sometimes less but it should not be losing weight. If you've made sure it has sufficient food, hasn't run out of water, and it's still losing weight then call a rescue immediately. It may have roundworm, lungworm, coccidia, fluke, thorny heads and all sorts of other things wrong with it. There is nothing you can buy to help it. It needs professional care from a wildlife expert. It will help the rescue or vet no end if you can provide them with a faecal sample. Place a whole one if possible or a splat if that's all there is, in a clean small pot and take it with you. It speeds up the identification of parastites and allows correct medications to be given. Once your hog has reached at least 600g but preferably more, it can be allowed to hibernate. You will still need to check it and provide food and water daily but its housing can go out into a shed or a garage with a window, so the animal gets daylight and darkness, where it may wish to sleep. You cannot make it hibernate and you must not remove food to try and force it to. Provide plenty of bedding for it to make a nest. The number of people who think it's OK to shove a handful of leaves in is amazing, would you be able to sleep outdoors in a handful of leaves? Hedgehogs make a complex, frost free nest, they need hay chopped into short strands, some dry leaves, some ripped up newspaper and plenty of it. Loosely fill the nest area and let them sort that out, add more to the main area and let them help themselves. They will pack it in tight, combed into place with their spines. YOU cannot make a nest for them, you are a useless hedgehog hibernaculum builder. 100% guaranteed. You absolutely must ensure food and water is available every single day, even when you think they might be hibernating. They may wake up, you are responsible for their life. You need to weigh once a week once they have hibernated to ensure they are not losing too fast. Any more than 5-10g a week and get advice. A hibernating hog can appear dead. DO NOT BURY IT. Their breathing becomes faint and very infrequent. They will feel cold to the touch. They may make a long hissing noise if disturbed or they may just move their spines slightly. Please continue to weigh once a week and make a note of it. If the weight starts to drop dramatically, bring it back inside and let it warm up when it should wake. Call a rescue for advice. Do not try to heat it up quickly or it could have a heart attack. You will need to clean daily unless you have no sense of smell or wish to keep unexpected visitors at bay. Keeping a hog in your dining room is a great way to avoid having people over for Christmas dinner. Use a pet or veterinary disinfectant cleaner, please do not use bleaches, Dettol, Flash or Cillit Bang type products. Hedgehogs lick new smells and will poison themselves. Take out the paper on the bottom and bin it. If the bedding is soiled, wet or smells of urine, replace it, check carefuly for any signs of a problem - blood means the hog needs to be checked over thoroughly, it could be a wound or internal bleeding so don't ignore it. Diarrhoea or foul smelling faeces can indicate an infection, take a sample and seek help. Clean the container, put in clean newspaper and food and water. It is usually helpful to have a lidded box, cat basket or deep container to put the hog in while you do this or you'll spend the next few hours playing hunt the hedgehog. You can also use this time to weigh it. Wash fleeces in a non-bio liquid, spin and they should come out dry. There are laws in this country protecting wildlife. They are covered by the Animal Welfare Act and if you pick up any animal you are responsible for it and must provide appropriate care. If you are going away you must find somebody reliable who will do the daily checks and cleaning, you can't just dump a load of food in there and leave it to get on with it. Any problems at all need to be dealt with immediately, call a rescue for advice. If you leave it for 24 hours you could have a dead or dying hog on your hands. Seek advice and act on it. If you find you can't cope get the animal to somewhere that can. Do not just stick it back out in your garden, that's abandonment and it may well die under some pretty nasty circumstances. You could find yourself in court. The animal cannot be released until the weather is mild and the ground unfrozen for at least a week ahead. You can only release it where it has access to at least 10 average sized gardens or other suitable habitat and there must be other hogs in the area. Captivity is not an option nor is trying to repopulate an area. Take advice from a rescue, don't go sticking it in the woods, it might look ideal territory to you but the hog may not agree. It is pointless spending time and money helping the hog to survive only to release it somewhere where it will die. Hedgehogs can walk into things but their spines stop them backing out. Coughing, take a poo sample to a rescue for checking. Phone first, don't just turn up and wave poo at them. Hogs only sweat through their tummy, don't use oils or creams or they'll overheat. Hog is lying flat on its tummy with legs sticking out at all 4 corners - it's hot. Hog doing contortions and frothing at the mouth. Always a good one to scare the hell out of you when you first see it but worry not, it found a new smell and it's spreading it all over. Why? Absolutely no idea. So there you have it, shimples! No it's not, it's scary, it's wonderful and it's a heck of a responsibility as the life of an animal is in your hands. Enjoy it while you can, spring will be here very soon and then you have to say goodbye. Get a good stock of tissues in.